(Al Hartmann | The Salt Lake Tribune) Families get an up-close look at a Bald Eagle at the Wildlife Education Center at Bear River Migratory Bird Refuge at Eagle Day event on Saturday Feb. 10. This eagle from Ogden Nature Center used for education can't fly. Usually up to several hundred eagles can be seen, each winter, as they migrate through the refuge, but not this year. The abnormal weather this Winter has changed their migratory pattern making live spottings scarce. (Al Hartmann | The Salt Lake Tribune) Families get an up-close look at a Bald Eagle at the Wildlife Education Center at Bear River Migratory Bird Refuge at Eagle Day event on Saturday Feb. 10. This eagle from Ogden Nature Center used for education can't fly. Usually up to several hundred eagles can be seen, each winter, as they migrate through the refuge, but not this year. The abnormal weather this Winter has changed their migratory pattern making live spottings scarce. (Al Hartmann | The Salt Lake Tribune) Families get an up-close look at a Bald Eagle at the Wildlife Education Center at Bear River Migratory Bird Refuge at Eagle Day event on Saturday Feb. 10. This eagle from Ogden Nature Center used for education can't fly. Usually up to several hundred eagles can be seen, each winter, as they migrate through the refuge, but not this year. The abnormal weather this Winter has changed their migratory pattern making live spottings scarce. 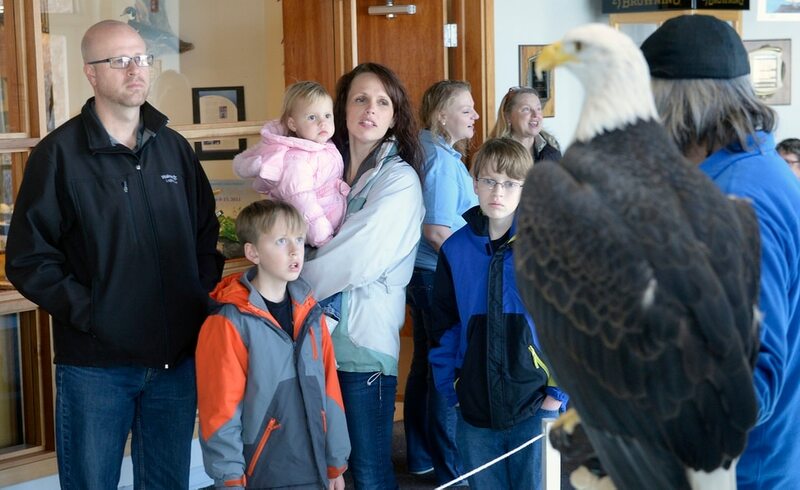 (Al Hartmann | The Salt Lake Tribune) Families get an up-close look at a Bald Eagle at the Wildlife Education Center at Bear River Migratory Bird Refuge at Eagle Day event on Saturday Feb. 10. This eagle from Ogden Nature Center used for education can't fly. Handler, Bryce King, left. Usually up to several hundred eagles can be seen, each winter, as they migrate through the refuge, but not this year. The abnormal weather this Winter has changed their migratory pattern making live spottings scarce. Brigham City • Visitors to Great Salt Lake bird refuges never know what they might see on any given day. It was supposed to be bald eagle viewing day at Farmington Bay, Bear River and Salt Creek. Several hundred spectators hoped to see the majestic birds. But this year’s strange northern Utah weather threw the annual event for a loop. And it’s not the first one in recent days. In the past two weeks, warmer than average weather has forced several cancellations and early closures, including the state’s annual ice fishing tournament at Fish Lake and its elk-viewing wagon rides in Hyrum, Midway Ice Castles tours and Soldier Hollow‘s Nordic skiing events. At eagle viewing day in Bear River Bird Refuge, however, the warm weather on Saturday proved both good and bad. 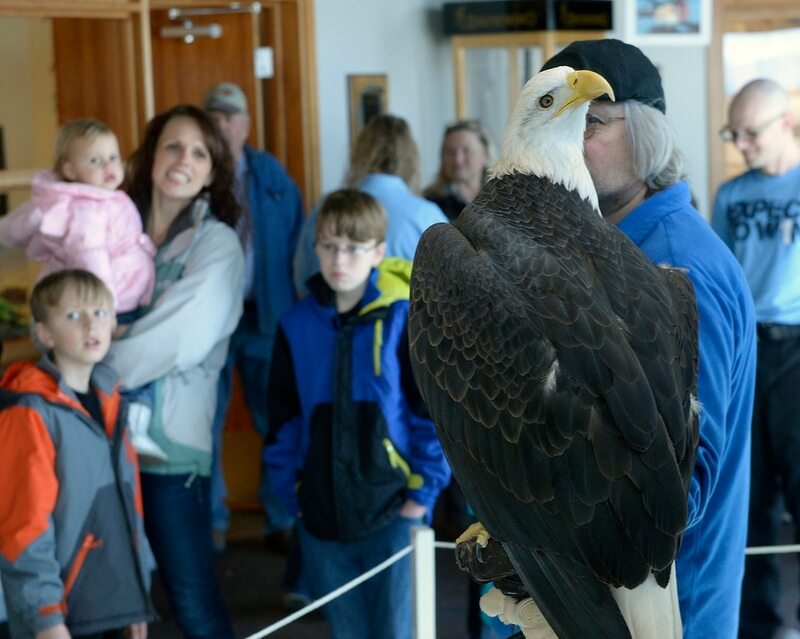 On the bad ledger, about the only eagle many saw was the 18-year-old captive bird the Ogden Nature Center brought to the James V. Hansen Wildlife Education Center at the federal Bear River refuge. Bear River visitor services manager Kathi Stopher said the warmer-than-normal weather this winter has kept refuge ponds from freezing. Normally, bald eagles wintering in northern Utah congregate around the few areas of open water, where they can eat fish, such as carp. The weather has kept ponds from freezing, resulting in fewer concentrations of eagles. While as many as 225 eagles migrated to Bear River as recently as winter 2015, only a few lucky folks spotted the wild birds Saturday. 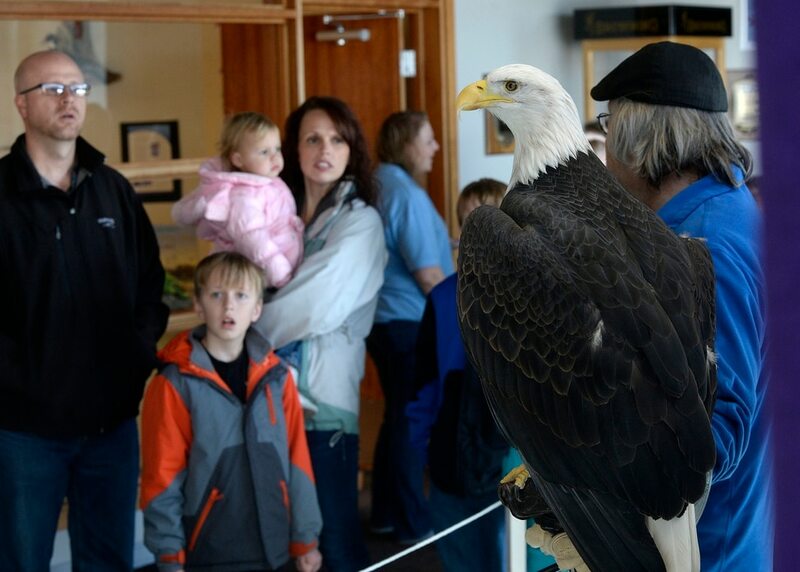 That didn’t keep young Ryker Fertig, of Corinne, from giving a thumbs up Saturday to the captive eagle he came within a few feet of at the Bear River visitor center. His mom, Elizabeth, said she often glimpses eagles in poplar trees on the road between Bear River and Corinne called the Iowa String, but no eagles were seen there Saturday afternoon. Those who ventured west to the 12-mile Bear River driving loop or headed over to nearby Compton’s Knoll that overlooks the state-operated Salt Creek Waterfowl Management Area found a different treat, also thanks to the weather. There swam hundreds of tundra swans, which seldom come to northern Utah this time of year. The bird usually come later in the winter or early spring. At Compton’s Knoll, visitors marveled at the sight of the large white birds and the distant sounds they made. There were also great blue herons, rough legged hawks and gulls to be seen on a wild, windy February day in which the sun and clouds danced back and forth across the distant mountains and storms systems blew in and out. Although reports indicated that a few more eagles flew over the Farmington Bay Waterfowl Management Area, manager Jason Jones said he had been concerned even before the viewing day that the eagles would be no-shows. None of this, however, seemed to bother visitors. The swans were an unexpected treat and, as veteran wildlife watchers know, there is always a pleasant surprise or two to enjoy any time one visits a refuge. Correction: Feb. 10, 10:46 p.m.: An earlier version of this story misspelled the name of the town Corinne.